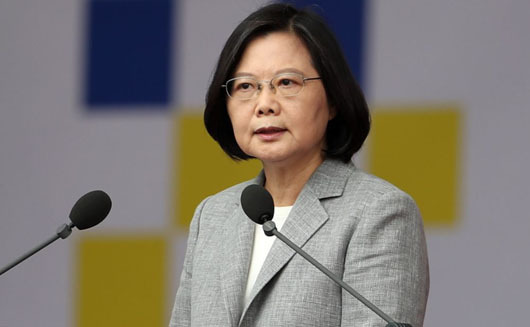 President Tsai Ing-wen on Oct. 10 said her government will boost defense spending and vowed that Taiwan will not “submit or yield” to China’s ongoing pressure to assert sovereignty over the self-ruled island. “At this time, China’s intimidation and diplomatic pressure not only hurts relations between both sides, but seriously challenges the peaceful stability in the Taiwan Strait,” Tsai said during a National Day speech in Taipei, Reuters reported. Taiwan plans to increase its defense budget each year in order to upgrade military capabilities, including resuming domestic development of advanced training aircraft and submarines, Tsai said. The Pentagon’s Defense Security Cooperation Agency last month announced plans to sell Taiwan spare parts and logistics support for F-16, C-130 and F-5 indigenous defense fighter jets. It will be the second U.S. weapons deal under President Donald Trump, after his administration in June 2017 agreed to sell a $1.4 billion arms package to Taiwan that included high-speed anti-radiation missiles, torpedoes, missile components and technical support for early warning radar. “I would like to pledge to everyone that we will not rashly increase antagonism, but we won’t submit or yield,” Tsai said in her Oct. 10 speech. China, which has never renounced the use of force to bring Taiwan under its control, has stepped up military encirclement drills around Taiwan, which Taipei has denounced as intimidation, the Reuters report said. Additionally, China has successfully pressured some nations to recognize Taiwan as a part of China. Three former allies of Taiwan – El Salvador, Burkina Faso and Dominican Republic – switched their allegiances to Beijing this year.